Screenshots of two Windows builds that are known internally as Windows Blue, have been leaked, which reveal that Microsoft has bumped Windows kernel to 6.3, where as Windows 8 uses kernel 6.2. Windows Vista used NT kernel 6.0, while Windows 7 jumped to 6.1, and Windows 8 to 6.2. A switch to 6.3 with Windows Blue suggests this is a major revision to Windows. According to TheVerge, I was one of the first sources of this image. btw, I am sure that this image is fake. Run your winver and see that is written in there. No Pro/Edition notice, just OS. So, as i said in my post, it can be photoshoped. Good point hb860, definitely fake! 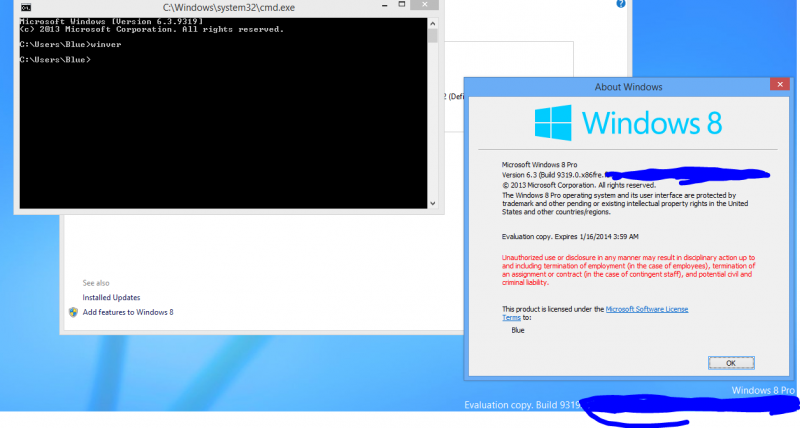 Windows 8.1 (Blue) build 9369 leaked! Is Windows Blue free, or will I have to buy it?